Let’s take a look at a quick list of what’s going on in this Template. Distinguish between comments and trackbacks / pingbacks) so that we can display trackbacks with simpler mock-up. From this point on, I’ll refer to both trackbacks and pingbacks as “Pingbacks”. That’s a lot of stuff going on for one template. But written out like that, it’s pretty straightforward. We’re going to use the function wp_list_comments() that conveniently spits out an ordered list of comments and pingbacks markup for your post (threaded too). To make our comments template code work, you’ll use a custom callback function that controls the layout of the actual comments and pingbacks. Open inc/template-tags.php and paste the following function at the very bottom of the file. Let’s explain what’s happening here in more detail. First, this code repeats for each comment or trackback we have. On lines 11-14, we use a PHP “switch statement“, which is a type of conditional similar to IF .. ELSE statements. In simplest terms, switch statements let you first determine the value of a variable, and display different code depending on the value of that variable. It’s pretty sweet. It’s also pretty bare, but you can pretty it up with just CSS alone. We’ll talk about CSS in a later lesson. 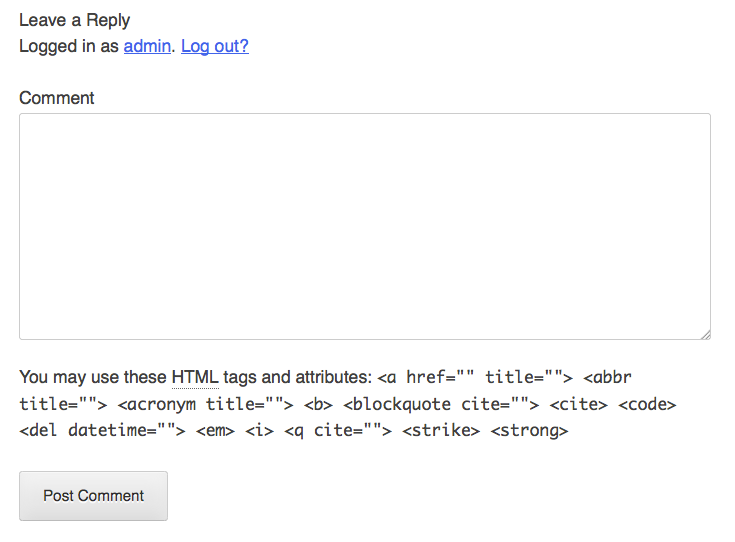 Notice how we don’t have any closing <li> tag on line 17. wp_list_comments() adds this part in automatically. Now, on line 18, the “break” statement means we’re done with pingbacks and trackbacks. The “default” statement on line 19 says, in English, “in the case that the current comment is not any of the other cases above, format it with the default markup on lines 21-41.” Since the only other cases above are pingbacks and trackbacks, this markup will be applied to all regular comments. Again, bare, but we’ll color it in later. It’s important that each individual comment li has comment_class() added (see line 21), because, like body_class() and post_class(), comment_class() adds useful classes to comments that you can target with CSS. For example, comments made by the post’s author get a class of “bypostauthor”, so you can distinguish the author’s comments from the rest. To change the default size of your gravatar, just change the 40 in echo get_avatar( $comment, 40 ); on line 25 above. The 40 is the size in pixels of your gravatar. In fact, if you want to alter the layout of the individual comment, you’d modify the code on lines 21-41 (or 15-16 for pingbacks). Just as with pingbacks, we don’t need a <li> tag to correspond with the opening li> on line 21, because WordPress will add it later. All righty, we end our “default” case with the “break” on line 52, and we end the switch statement on line 53 with “endswitch”. I haven’t scared you away have I? I’ll be honest, it’s not that scary. We have to put our shape_comment() function that we walked through above to use inside the comments template. There are helpful PHP comments that should guide you along in understanding what’s happening. Paste this code in the comments.php file. * to use shape_comment() to format the comments. * define shape_comment() and that will be used instead. * See shape_comment() in inc/template-tags.php for more. If you would like to change elements in the comment form, you can do so by passing different parameters to the comment_form() function. See the Codex for a full list of parameters. And that’s it. You’ve got a pretty sweet Comments Template to call your very own. I hate the Comments Template. […] It can be a confusing mess. I agree! But it can look different (with the help of some actions and filters in comment_form()). I am new to WordPress, so I had no clue that I needed to do that. May want to include that in your tutorial. Just a thought. Otherwise, this is a great set of tutorials! Thanks! Any idea why the plural part of the string on line 32 in comments.php is not showing up as translateable in PoEdit? It only gathers the first part. So I found out what was going on. I had to make PoEdit check for plural translations and voila it was there. After this step, and double checking it, no form appeared in my preview. The sample comments are all there. Where does pull the form from? 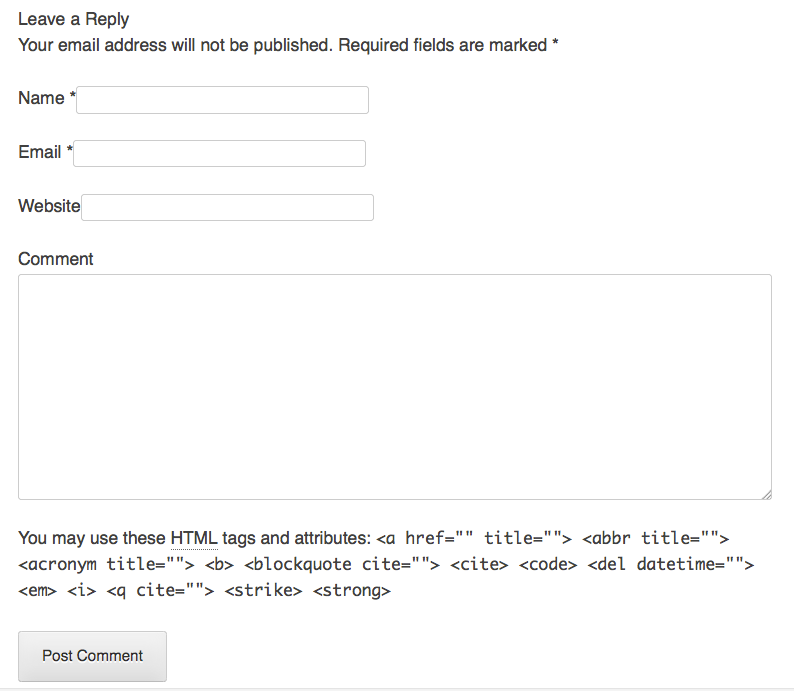 Thanks, so… I think that comment in WordPress are too simply and no-secure. Ah, I feel this is the most difficult part of this series. Hi there. You might be interested in Jetpack Comments, which is part of the Jetpack plugin. Jetpack comments allows your visitors to comment using one of their social networking accounts, such as Facebook or Twitter. Is it supported for comment pagination? Thanks for the tutorials. I’ve found them extremely helpful. Hi Rick – good catch, thanks. I’ve made the fix. Glad you’ve found the tutorials helpful! I don’t want comments to be any where on my site, ever. Do you I have to include this file and what else do I need to do to exclude them from my site? Thanks! Be sure to also remove or comment out the opening and closing PHP tags just before and after the above code too.